Every New Year’s Eve for as long as we can remember, St Andrew’s bell ringers have celebrated by ‘ringing in’ the New Year. This year was no exception and at 11.30pm a small group of ringers gathered to begin their ring. As the midnight hour approached, the number of bells gradually reduced leaving just Gavin Carpenter to strike the tenor 12 times at midnight. The rest of the ringers then joined in again to welcome 2018 with their joyful sound. In recent years, our vicar Barry and wife Mary have come along to watch the fireworks from the top of the tower and open a bottle of champagne whilst the bells ring. The photo shows Mary and Barry joining the ringers afterwards for a celebratory drink. Barry then thanked the ringers for their efforts during the past year, particularly the peals. The bell ringers’ Christmas peal was successfully completed in 3 hours and 9 minutes. Rung for The Festival of Christmas. First on 10 – 5 & 7; First Grandsire – 2,5 & 7. On 20th November 2017, HM Queen Elizabeth II and Prince Philip, Duke of Edinburgh, celebrated their Platinum (70th) Wedding Anniversary. The August 2017 edition of the Hornchurch parish magazine records the death of a Hornchurch ringer, John Brockhurst, on November 2nd 1917 in Palestine during WW1. C.T. Perfect’s book about Hornchurch, written that year, lists among the ringers J.W. Brockhurst and J. Brockhurst who was the Tower Captain. It is likely that it is the former who was killed and the latter possibly his father. On November 5th, the nearest Sunday to the centenary of John’s death, the current Hornchurch ringers rang a quarter peal for evensong and in memory of John Brockhurst. Sylvia Blows was known to the bell ringers through her late husband Dennis who was a bell ringer and chorister. Sylvia was a very active member of the church here at St Andrew’s in the 1980’s and 1990’s before moving away to be closer to her family. One of her many roles included a long period as PCC Secretary. For Evensong and remembering Sylvia Blows, widow of Dennis Blows and previously an active church member at St Andrew’s, who recently passed away. First in method – 2. Bell ringer Rosemarie Edwards rung continuously for about 45 minutes prior to Evensong at St Andrew’s on Sunday 24th September to achieve her first quarter peal at the first attempt. Although a member of the bell ringers at Holy Cross Church in South Ockendon, Rosemarie learnt to ring here at St Andrew’s and visits us regularly for extra practise. Her efforts have now been rewarded with this success and we send her congratulations from all the team. During the service on Promotion Sunday (10th Sept.) prizes were awarded to 5 bell ringers who have rung their first quarter peal in the past year or so. It takes a long time to learn to ring to the standard of a quarter peal (years rather than weeks) and requires a lot of hard work and practise. Our congratulations therefore go to Jacky Stockwell, Paul Shrubsole, Jane Harper, Ethan Musham, and Michelle Long for achieving their first quarter peals and receiving their prizes from Ken Wylie, our Associate Priest. On 9th September 2017, Hornchurch bell ringer Jonathan Slack organised our Autumn Outing to central London. The churches were chosen specially because they had new sets of bells or because their bells had been overhauled in recent times. At 10.00am, more than 30 ringers and friends arrived by public transport at St Dunstan-in-the-West, Fleet Street, to have a ring on their new set of 10 bells, cast in 2011 by Whitechapel and installed in 2012. These are a fairly light set of bells with the tenor weighing 10 cwt, enabling us to ring well and finishing with a good piece of Stedman Caters. We then caught the bus to Bank Station and walked the short distance to St Michael’s, Cornhill to have a go on their new ring of 12 bells, again cast in 2011 but this time by John Taylor of Loughborough. These bells are a lot heavier than St Dunstan with the tenor weighing more than 32 cwt (1.5 tons) and required more skill to ring. Again our ringers performed well with many ringing on 12 bells for the first time, including Jane Harper, Lisa Schofield, Rosemarie Edwards and Michelle Long. Ringers in the tower at St Michael’s, Cornhill. Jane, Rosemarie & Lisa: rang on 12 for the first time. A welcome lunch-break was followed by a walk to Lower Thames Street to ring on the 12 new bells of St Magnus the Martyr cast in 2008/09 by Whitechapel. Here, Leonie McCaughren and Rebecca Woolward rang changes on 12 and we attempted our most ambitious ringing of the day; Stedman Cinques and Little Bob Maximus. Leonie and Rebecca: rang well on 12. Our final tower of the day, St Katharine Cree in Leadenhall Street, was again within walking distance. These are an easy-going set of 6 bells having been re-hung in a new frame in 2009. The ringing here was well organised by Gavin Carpenter and made for a relaxing end to a successful day. Our thanks go to Jonathan, our organiser, and to the many ringers and friends who supported. Prior to the evening service on Sunday 9th July, St Andrew’s bell ringer Michelle Long attempted her first quarter peal. After 45 minutes of pulling and concentrating, the bells came back into rounds and success was achieved. 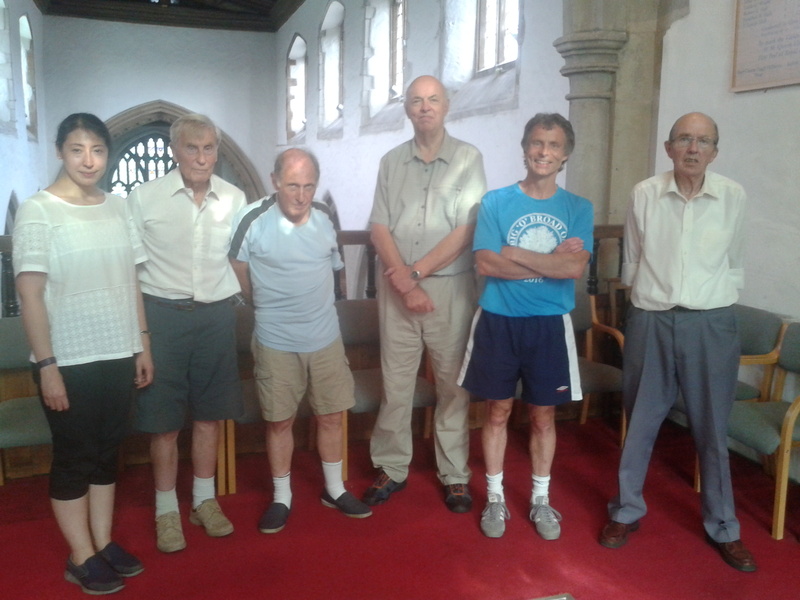 Every year, the Essex Association of bell ringers organise a striking competition where teams of 6 ringers are judged on the accuracy of their ringing. 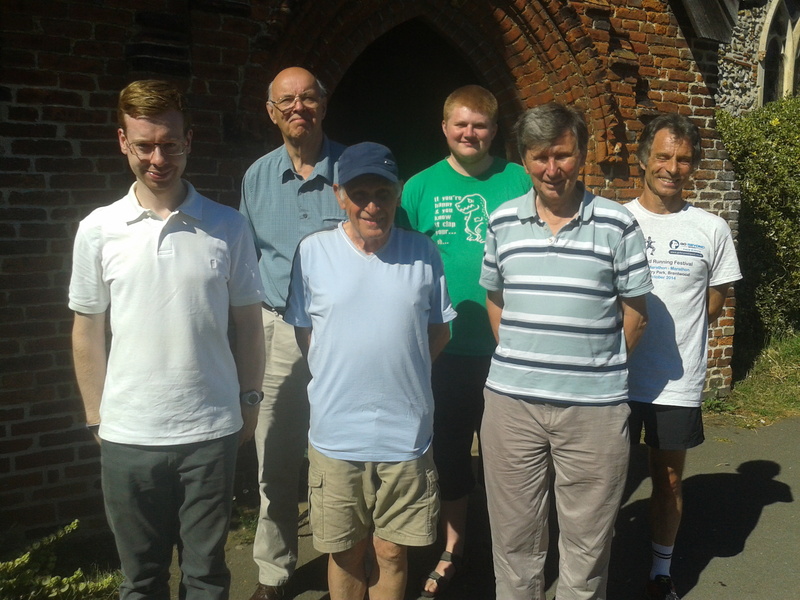 The competition is open to all towers in the county of Essex and after winning the District heats at Chigwell, St Andrew’s ringers took a team to the finals at Colne Engaine. Our team performed well, ringing for about 8 minutes and given 31.5 faults (mistakes) for the 240 changes. The competition was won by Kirby Le Soken who made only 14 faults, but Hornchurch finished in 6th place, which was a good position out of the 10 teams that took part.